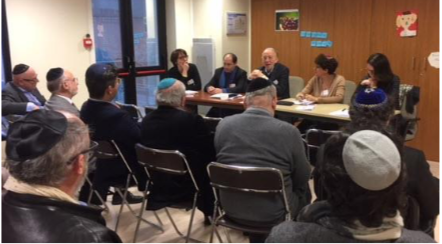 In March, Kehilat Gesher participated in the quatrième rencontres du judaïsme libéral francophone (the fourth edition of the Conference of Francophone Progressive Judaism, March 23-25). “How to Live a Jewish Life in a Complicated World” was the theme of the conference, a three-day convergence of liberal Jewish communities and their members from all over the French-speaking world. Workshops and lectures covered subjects ranging from involving the next generation of Jewish leaders, to the role of senior citizens, to the relationship between liberal communities and Israel. Our rabbi Tom Cohen and our president Anne Sebbag participated in the workshop “The relationship between rabbis and their communities on Friday, March 23. On the evening of Saturday, March 24, the Kehilat Gesher Choir gave a concert for Havdalah. An article on the conference was included in the April edition of the European Union for Progressive Judaism newsletter (to download the newsletter, please click here).